Alcantara et al.34 described how chiropractic adjustments could reduce tinnitus, vertigo and hearing loss in a patient with cervical subluxation and temporomandibular disorder. Symptoms eventually ceased after nine sessions. Kessinger et al.32 documented clinical changes after chiropractic sessions in a geriatric patient with tinnitus, vertigo, hearing loss and cervical alterations from C3 to C7. Throughout the sessions, the patient’s symptoms were alleviated and structural/functional improvements were also evident through radiographic examination. 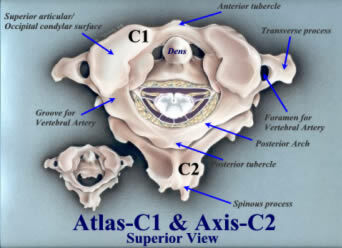 In contrast to classical chiropractic adjustment, Arlen’s atlas adjustment is performed without traction, rotation or extension of the cervical spine.37 By means of irritation and tension of the posterior cervical muscle, one might increase the afferent input to the vestibular nuclei in the brain stem, which might give rise to tinnitus.37 Thus, reduction of the tension via atlas therapy seems to lower the proprioception and nociception output, leading to normalization of the flow of information to the brain stem, and, as a consequence, tinnitus improvement. It seems that some somatosensory tinnitus could be alleviated by correcting the misalignment of the cervical spine through chiropractic adjustment, especially in the upper cervical region. Such alignment might allow the entire spine to reposition itself and possibly correct the input of the region through the somatosensory pathway on the auditory system. According to Kaute,37 many other methods are used to relax the neck muscles, with some success in treating tinnitus: the Alexander method, autogenous training, the Brügger method, craniosacral adjustment and Feldenkrais. All act on the same point – the posterior neck muscle. Nevertheless, as much as this topic has been receiving more attention in the current literature, it still needs further clarification.